Under the gold standard, currency is either in coins struck with a known amount of gold or in notes that the issuers guarantee to redeem in gold, ideally for an amount fixed in advance. Gold standard currencies can be internal, which means that domestic holders of notes may redeem them for specie, or international only, where only a limited number of entities, for example central banks, have the right to demand conversion to gold. Currencies that are backed by fixed amounts of gold have a constant exchange rate between each other. The purposes of a gold standard are to prevent inflationary expansion of the money supply, to maintain a fixed value against which other prices can be measured, and to allow wider circulation, including clearing of transactions, with a greater degree of trust in both the stability of the quantity and quality of money. Gold standards of various kinds have been used in both national and international forms, and gold standard currencies have often been used as the monetary unit against which currencies with a less fixed value have been measured. Gold standard currencies of the past have included the Venetian ducat and the British pound sterling in the late 19th century. Gold was the basis for the Bretton Woods Agreements, which collapsed in 1971-1972. In modern mainstream economic thought, a gold standard is considered undesirable because it is associated with the collapse of the world economy in the late 1920's, and that aggregate supply and demand is a far better means of regulating interest rates, money supply and monetary basis. However, many other theories have been advanced for the turbulent economic conditions that existed at this time. While the gold standard is not currently in use, it has advocates for its resurrection and forms part of a basic theory of monetary policy as a standard for comparison for other monetary systems. Advocates of a variety of gold standards argue that gold is the only universal measure of value, that gold standards prevent inflation by preventing the creation of unlimited money supply in a fiat currency, and that it provides the soundest theoretical basis for a monetary system. Due to its rarity, durability, and the general ease of identification through its unique colour, weight, ductility and acoustic properties, gold is a commodity that merchants and traders came to select as a common unit of account - thus it has long been used as a form of money and store of wealth. The exact nature of the evolution of money varies significantly across time and place, though it is believed by historians that gold's high value for its beauty, density, resistance to corrosion, uniformity, and easy divisibility made it useful both as a store of value and as a unit of account for stored value of other kinds — in Babylon, a bushel of wheat was the unit of account, with a weight in gold used as the token to transport value. Early monetary systems based on grain used gold to represent the stored value. Banking began when gold deposited in a bank could be transferred from one account to another by a giro system, or lent at interest. When used as part of a commodity money system, the function of paper currency is to reduce the danger of transporting gold, reduce the possibility of debasement of coins, and avoid the reduction in circulating medium to hoarding and losses. The early development of paper money was spurred originally by the unreliability of transportation and the dangers of long voyages, as well as by the desire of governments to control or regulate the flow of commerce within their dominion. Money backed by a specie sometimes is called representative money, and the notes issued often are called certificates, to differentiate them from other forms of paper money. Through most of human history, however, silver was the primary circulating medium and major monetary metal. Gold was used as an ultimate store of value, and as means of payment when portability was at a premium, particularly for payment of armies. Gold would supplant silver as the basic unit of international trade at various times, including the Islamic Golden Age, the peak of the Italian trading states during the Renaissance, and most prominently during the 19th century. Gold would remain the metal of monetary reserve accounting until the collapse of the Bretton Woods agreement in 1971, and it remains an important hedge against the actions of central banks and governments, a means of maintaining general liquidity, and as a store of value. The first metal used as a currency was silver more than 4,000 years ago, when silver ingots were used in trade. Gold coins first were used from 600 B.C. However, long before this time, gold, as per silver, was used as a store of wealth and the basis for trade contracts in Akkadia, and later in Egypt. Silver remained the most common monetary metal used in ordinary transactions until the 20th century. It still circulates in certain bi-metallic coins, such as the Mexican 20-peso coin circa 2005. The Persian Empire collected taxes in gold, and when Alexander the Great conquered it, this gold became the basis for the gold coinage of Alexander's empire. The paying of mercenaries and armies in gold solidified its importance: gold became synonymous with paying for military operations, as mentioned by Niccolò Machiavelli in The Prince 2,000 years later. The Roman Empire minted two important gold coins: the aureus, which was approximately 7 grams of gold alloyed with silver, and the smaller solidus, which weighed 4.4 grams, of which 4.2 was gold. The Roman mints were fantastically active — the Romans minted and circulated millions of coins during the course of the Republic and the Empire. After the collapse of the Western Roman Empire and the exhaustion of the gold mines in Europe, the Byzantine Empire minted successor coins to the solidus called the nomisma or bezant. These were of the same weight and high purity as their Western Empire counterparts and still are considered to be solidii. Unfortunately, the Byzantine empire gradually degraded the purity of the coin from about the 1030s until, by the turn of the 11th century, the coinage in circulation was only 15% gold by weight. This represented a tremendous drop in real value from the old 95% to 98% gold Roman coins. From the late seventh century, trade was increasingly conducted in the dinar. The dinar was a gold coin modeled on the original Roman solidus, having similar size and weight to the Byzantine solidus but produced by the Arab Empire. The Byzantine solidus and the Arab dinar circulated alongside one another for about 350 years before the solidus began its decline. The dinar and dirham were gold and silver coins, respectively, originally minted by the Persians. The Caliphates in the Islamic world adopted these coins, but it is with Caliph Abd al-Malik (685–705) who reformed the currency (685–705) that the history of the dinar usually is thought to begin. He removed depictions from coins, established standard references to Allah on the coins and fixed ratios of silver to gold. The growth of Islamic power and trade made the dinar the dominant coin from the Western coast of Africa to northern India until the late 1200s, and it continued to be one of the predominant coins for hundreds of years afterward. In this way the solidus size, purity and weight of coin - whether it was called the dinar, the bezant, or the solidus itself - was a desired unit of account for more than 1,300 years and outlived three global empires. In 1284, the Republic of Venice coined its first solid gold coin, the ducat, which was to become the standard of European coinage for the next 600 years. Other coins, the florin, noble, grosh, złoty, and guinea, also were introduced at this time by other European states to facilitate growing trade. The ducat, because of Venice's pre-eminent role in trade with the Islamic world and its ability to secure fresh stocks of gold, would remain the standard against which other coins were measured. Beginning with the conquest of the Aztec and Inca empires, Spain had access to stocks of new gold for coinage in addition to silver. The primary Spanish gold unit of account was the escudo, and the basic coin the 8 "escudos" piece, or "doblón", which originally was set at 27.4680 grams of 22 carat (92%) gold, using current measures, and was valued at 16 times the equivalent weight of silver. The wide availability of milled and cob gold coins made it possible for the West Indies to make gold the only legal tender in 1704. The circulation of Spanish coins would create the unit of account for the United States, the "dollar" based on the Spanish silver real, and Philadelphia's currency market would trade in Spanish colonial coins. The adoption of gold standards proceeded gradually. This has led to conflicts between different economic historians as to when the "real" gold standard began. Sir Isaac Newton included a ratio of gold to silver in his assay of coinage in 1717 that created a relationship between gold coins and the silver penny, which was to be the standard unit of account in the Law of Queen Anne; for some historians this marks the beginning of the "gold standard" in England. However, more generally accepted is that a full gold standard requires that there be one source of notes and legal tender, and that this source be backed by convertibility to gold. Since this was not the case throughout the 18th century, the generally accepted view is that England was not on a gold standard at this time. Germany was created as a unified country following the Franco-Prussian War; it established the Reichsmark, went on to a strict gold standard, and used gold mined in South Africa to expand the money supply. Rapidly most other nations followed suit, since gold became a transportable, universal and increasingly stable unit of valuation. See Globalization. Throughout the decade of the 1870s, deflationary and depressionary economics created periodic demands for silver currency. However, such attempts generally failed, and continued the general pressure towards a gold standard. By 1879, only gold coins were accepted through the Latin Monetary Union, composed of France, Italy, Belgium, Switzerland and later Greece, even though silver was, in theory, a circulating medium. The period from 1880 to 1913 is often called the "classical gold standard." It featured a core of nations, centered on the Bank of England, that adhered to a fixed gold price and continuous convertibility, with other nations which were less strict in their adherence to convertibility at a fixed amount of gold paying higher interest rates in gold denominated currencies. Central banks were supposed, according to what have been called "the rules of the game," to adjust interest rates to maintain the fixed exchange rate between the domestic currency and gold. Gold was used to settle accounts between nations. The price when it became profitable to export or import gold from a country was the "gold point" and nations which traded above or below the "gold point" saw inflows or outflows of gold, and usually took action to stem outflows of gold, or to convert inflows of gold into a stable form to prevent inflation. The gold standard of this period was not perfectly fixed; instead, central banks had varying degrees of coöperation and competition. On one side of the spectrum were true monetary unions where the currencies were tightly interlocked, through loose monetary unions, to nations whose participation in the gold standard was a matter of international payments only. The purest monetary union was the Austro-Hungarian Empire, which had the labor flexibility and interconnectedness to support an almost fixed rate of exchange. The Latin and Scandinavian monetary unions allowed co-circulation of coins, had clearing agreements between the central banks that substituted checks for physical transfers, and a close band of interest rates. The main gold standard of Europe was maintained by a settlement system, centered on London. The Bank of England adjusted interest rates to maintain the price relationship of the pound to other major currencies. This discount rate was used internationally to determine the amount by which trade instruments would be adjusted between buyers and sellers. The key change in this period was the adoption of a monetary policy to raise interest rates in response to gold outflows, or to maintain large stocks of gold in the reserves of the central bank. This policy created a credibility of commitment to the gold standard. According to Lawrence Officer and Alberto Giovanni, this can be seen from the relationship between the Bank of England rate, and the flow between the pound and the dollar, mark and franc. From 1889 through 1908, the pound maintained a direct bank rate rule relationship with the dollar 99% of the time, and 92% of the time with the mark. Thus, according to the theory of gold standard monetary dynamics, the key to this credibility was the willingness of the Bank of England to make adjustments to the discount rate to stabilize sterling to other currencies in the gold, or de facto gold, standard world, during the peak period of the gold standard composed of 360 months, the Bank of England bank rate was adjusted over 200 times in response to gold flows, a rate of change higher than current central banks. At the peripheries nations such as the United States and Russia allowed significant internal deviations from the gold standard. The United States issued fixed amounts of silver backed currency. Russia printed paper money and minted coins, the paper money selling at rate between 60% and 75% of specie, until 1881 when a program to put Russia on the gold standard internally began, including mining, exporting wheat and importing restrictions. Russians were allowed to write contracts in gold rubles in 1895, and in 1897 convertibility was established, at the rate of 1.5 paper rubles for each new ruble. However, the government reserved the right to print up to 300 million rubles not backed by gold that were in domestic circulation. During this period there were severe depressions punctuating periods of strong growth, as gold standard backed capital was freer to be invested in a wider range of nations. The confidence in convertibility would lead greater ability of governments to borrow funds on the world credit markets, as they existed at that time, and to attract long-term projects. A notable example of this is the building of railway networks by the United States and Russia, as well as industrial development programs. The gold standard attracted nations into it, because access to capital was a powerful incentive to give up at least some of the seignorage powers inherent in silver and paper based currencies. This became an economic circle - the more nations participated in the international gold standard, the more those who did not had greater difficulty selling goods and obtaining credit. One of the most observable effects of the spreading gold standard was a marked decrease in the volatility of inflation rates. Under the previous silver and paper systems, swift inflation could be followed by sharp deflation, and then back to inflation in relatively short periods of time. Beginning with the general adoption of the gold standard, such wide swings grew smaller and smaller, and deflation replaced inflation as the normal state of price movement. This was seen at the time as allowing businesses to plan investment and expenses more easily, and reduce the risk of building large industrial projects. At the same time it caused a dramatic fall in aggregate demand, and a series of long Depressions in the United States and the United Kingdom. This should not be confused with the failure to industrialize or a slowing of total output of goods. Thus the attempts to produce alternate currencies include the introduction of Postal Money Orders in Britain in 1881, later made legal tender during World War I, and the " Greenback" party in the US, which advocated the slowing of the retirement of paper currency not backed by gold. Many nations circulated limited amounts of unbacked currency, or used postal money--redeemable for postage rather than gold--in order to provide liquidity, particularly in remote agricultural areas where forfaiting and forward settlement of bills of trade were not available. By encouraging industrial specialization, industrializing countries grew rapidly in population, and therefore needed sources of agricultural goods. The need for cheap agricultural imports, in turn, further pressured states to reduce tariffs and other trade barriers, so as to be able to exchange with the industrial nations for capital goods, such as factory machinery, which were needed to industrialize in turn. Eventually this pressured taxation systems, and pushed nations towards income and sales taxes, and away from tariffs. It also produced a constant downward pressure on wages, which contributed to the "agony of industrialization". The role of the gold standard in this process remains hotly debated, with new articles being published attempting to trace the interconnections between monetary basis, wages, and living standards. By the 1890s in the United States, a reaction against the gold standard had emerged centered in the Southwest and Great Plains. Many farmers began to view the scarcity of gold, especially outside the banking centers of the East, as an instrument to allow Eastern bankers to instigate credit squeezes that would force western farmers into widespread debt, leading to a consolidation of western property into the hands of the centralized banks. The formation of the Populist Party in Lampasas, Texas specifically centered around the use of "easy money" that was not backed by gold and which could flow more easily through regional and rural banks, providing farmers access to needed credit. Opposition to the gold standard during this era reached its climax with the presidential campaign of Democrat William Jennings Bryan of Nebraska. Bryan argued against the gold standard in his Cross of gold speech in 1896, comparing the gold standard (and specifically its effects on western farmers) to the Crown of Thorns worn by Jesus at his crucifixion. After being defeated in 1896, Bryan ran and lost again in 1900 and 1908, each time carrying mostly Southern and Great Plains states. The book (and, subsequently, the movie) The Wonderful Wizard of Oz has been interpreted as a metaphor for the politics surrounding the Gold Standard with the "Yellow Brick Road" - see Political interpretations of The Wonderful Wizard of Oz, and which points out that Dorothy returned with silver (not golden) shoes. By 1900 the need for a lender of last resort had become clear to most major industrialized nations. The importance of central banking to the financial system was proven largely by examples such as the 1890 bail out of Barings Bank by the Bank of England. Barings had been threatened by imminent bankruptcy. Only the United States still lacked a central banking system. There had been occasional panics since the end of the depressions of the 1880s and 1890s which some attributed to the centralization of production and banking. The increased rate of industrialization and imperial colonization, however, had also served to push living standards higher. Peace and prosperity reigned through most of Europe, albeit with growing agitation in favour of socialism and communism because of the extremely harsh conditions of early industrialization. A major part of this increase in living standards was the increase in international trade volumes, aided by a sophisticated forfaiting for trade by the discounting of bills of sale (See Real bills doctrine). In this system the ability to settle a complex series of transactions involved in the manufacture and final sale of goods was aided by having a single value standard and single currency basis to value transactions. This trade period is often called "The First Era of Globalization" because of the increase in trade. This period culminated in 1913, to be ended by the First World War. Trade volumes would not reach the same percentage of GDP until well after the Second World War, exactly when depending on the means used to measure. Purchase of such bills was considered to be part of the process by which the Federal Reserve in the United States would regulate the money supply. London's centrality to this system was a key reason why the pound, rather than some other gold based currency, was the anchor currency of the era. The increase in trade expanded both industrialization and agriculture, and provided an incentive for more developed nations to invest in transportation and other infrastructure in less developed nations, in order to be able to gain access to raw materials. It also provided an incentive for the rapid development of cargo transportation by sea, including the construction of the Suez and Panama canals. The increasing political tensions of the first decade of the 20th century placed pressure on monetary unions, and on governments. Severe downturns struck most of the industrial nations at some point during the decade, and agitation for reform of the gold standard increased. In the United States anti-gold Democrat William Jennings Bryan ran for the Presidency three times, and a wing of the ruling Republican Party declared itself for silver dollars. In 1904 the Scandinavian monetary union was dramatically renegotiated, leading to an end of co-circulation and commission free checks between the central banks as part of a larger political crisis. These pressures were not seen then as leading to an end of the gold standard, but as pressure to adopt mechanisms to manage the shocks which industrialization produced. Another pressure was the beginning of armaments build up, particularly the new generation of battleships, which were weapons of a size and complexity far beyond that which had previously existed. The Russo-Japanese War and subsequent revolution placed pressure on both Russia and Japan monetarily, and the arms race between navies was a tremendous drain on government holdings of gold in Great Britain and Germany. However, trade volumes continued to increase, convertibility remained a central monetary policy of most major nations, and the gold standard and its economic system extended its reach farther and farther around the globe. This came to an abrupt halt with the outbreak of World War I. The United Kingdom was almost immediately forced to take steps that would lead to its gradually leaving its gold standard, ending convertibility to Bank of England notes starting in 1914. By the end of the war England was on a series of fiat currency regulations, which monetized Postal Money Orders and Treasury Notes (later called banknotes, not to be confused with US Treasury notes). The need for larger and larger engines of war, including battleships and munitions, created inflation. Nations responded by printing more money than could be redeemed in gold, effectively betting on winning the war and redeeming out of reparations, as Germany had in the Franco-Prussian War. The US and the UK both instituted a variety of measures to control the movement of gold, and to reform the banking system, but both were forced to suspend use of the gold standard by the costs of the war. The Treaty of Versailles instituted punitive reparations on Germany and the defeated Central Powers, and France hoped to use these to rebuild her shattered economy, as much of the war had been fought on French soil. Germany, facing the prospect of yielding much of her gold in reparations, could no longer coin " Goldmark", and moved to paper currency. At the end of the war, there was a global period of sharp inflation, where even the winning nations faced economic dislocations. Since high inflation had not been experienced in almost a generation in the industrialized core, this period was seen as absolute proof that the gold standard was a defense against inflation caused by paper money. By 1920 there was a general belief that price stability would only return with the reestablishment of the gold standard, a conviction that would remain in place until the 1930s. The series of arrangements to prop up the gold standard in the 1920s would constitute a book length study unto themselves, with the Dawes Plan superseded by the Young Plan. In effect the US, as the most persistent positive balance of trade nation, lent the money to Germany to pay off France, so that France could pay off the United States. After the war, the Weimar Republic suffered from hyperinflation and introduced " Rentenmark,” an asset currency, to halt it. This worked properly, although one more year had to pass until a new gold backed Reichsmark came into circulation. Important in the efforts to restore the gold standard were arms limitation talks centered around restraining building of battleships in particular, negotiations over trade barriers, and attempts to engage in deflation to return prices to their pre-war levels. This led to both the Bank of England and the United States Federal Reserve to "sterilize" gold inflows. This in turn forced nations with gold outflows to deflate more sharply in order to maintain price parity. While the United States, as both an industrial power and exporter of oil, which was becoming an increasingly important commodity as the world economy mechanized, was able to weather a series of short down turns during the decade, other nations experienced more and more economic instability. In 1925 Winston Churchill, then Chancellor of the Exchequer, seen as a stepping-stone to Number 10 Downing, attempted to return Great Britain to the gold standard with a series of steps, which would gradually have restored convertibility. However, it was also a goal to reverse the price increases, which required a contraction of the money supply. The resulting economic downturn both chased Churchill from the fast track to power, and created a government crisis. This was the leading edge of the global down turn now known as the Great Depression, and with it came a seeming bind for monetary policy and economic theory. On the one hand it seemed that suspension of the gold system would lead to paper money and either high inflation or hyper-inflation, and on the other hand, the mechanisms for maintaining the gold standard - government austerity, higher taxes, monetary contraction and higher interest rates, led directly to severe economic collapse, unsustainably high unemployment, and agitation for communist or other radical forms of government. John Maynard Keynes was one economist who argued against the adoption of the pre-war gold price believing that the rate of conversion was far too high and that the monetary basis would collapse. He called the gold standard “that barbarous relic.” This deflation reached across the remnants of the British Empire everywhere the Pound Sterling was still used as the primary unit of account. In the UK the standard was again abandoned in 1931. Sweden abandoned the gold standard in 1929, the US in 1933, and other nations were, to one degree or another, forced off the gold standard. In 1933, during the Great Depression, the London conference marked the death of the international gold standard as it had developed to that point in time. While the United Kingdom and the United States desired an eventual return to the Gold Standard, with President Franklin D. Roosevelt saying that a return to international stability “must be based on silver instead of gold” — neither was willing to do so immediately. France and Italy both sent delegations insisting on an immediate return to a fully convertible international gold standard. A proposal was floated to stabilize exchange rates between France, the United Kingdom and the United States based on a system of drawing rights, but this too collapsed. The central point at issue was what value the gold standard should take. Cordell Hull, the US Secretary of State, was instructed to require that reflation of prices occur before returning to the Gold Standard. There was also deep suspicion that the United Kingdom would use favorable trading arrangements in the Commonwealth to avoid fiscal discipline. Since the collapse of the Gold Standard was attributed, at the time, to the U.S. and the UK trying to maintain an artificially low peg to gold, agreement became impossible. Another fundamental disagreement was the role of tariffs in the collapse of the gold standard, with the liberal government of the United States taking the position that the actions of the previous American Administration had exacerbated the crisis by raising tariff barriers. As part of this process, many nations, including the U.S., banned private ownership of gold either de jure or de facto. In the United States Franklin Delano Roosevelt using the Trading With the Enemy Act for statutory authority to abrogate gold and silver clauses in U.S. Securities and impose fines of up to $100,000,000 on those who refused to do so. Over this period FDR passed two laws prohibiting U.S. citizens and the Federal Reserve ownership of gold, Executive Order 6102 of 1933 and the Gold Reserve Act of 1934. Jewelry, private coin collections, and the like were exempt from this ban, which in any case seems not to have been enforced too zealously. In 1975 all restrictions on the right of American citizens to own gold were abolished. Other nations suspended convertibility, prohibited exportation of gold, and required taxes be paid in gold. When France went off the gold standard in 1936, it ordered its citizens to turn in their privately held gold for government notes, but attained very little compliance . During the period of the gold ban American citizens were allowed to hold legal tender only in the form of central bank notes. While this move was argued for under national emergency, it was controversial at the time. The Supreme Court upheld the Congressional action in 1934 , but there are still some who regard it as a usurpation of private property . Part of the reason for these restrictions is that the theory of the gold standard was that nations with a net inflow of gold should allow inflation, which would then encourage imports automatically, while nations with a gold outflow should deflate, thus shifting effort to exporting to obtain gold. However the United States in particular had a policy of maintaining price stability, in response to the dramatic inflationary spike at the end of the First World War, and "sterilized" influxes of gold by contracting the money supply, what would now be called "M1", in order to prevent increases in the general level of prices. This forced nations with an outflow of gold to deflate even farther to adjust, and helped unravel the series of loan agreements that had been set up in the wake of the Treaty of Versailles. From 1931 through 1936 nations left the gold standard, beginning with Britain in 1931 after a run on the pound. France, the Netherlands and Switzerland finally left the gold standard in 1936. In the present the general agreement of monetary policy research is that there is a strong correlation between leaving the gold standard and economic recovery, as part of the monetary theory of the Great Depression. This theory is held by both liberal and conservative economists, but is vehemently disputed by most supporters of a renewed gold standard, who argue the reverse: that the failure to commit to gold was the cause of the Great Depression. In the years that followed, nations pursued bilateral trading agreements, and by 1935 the economic policies of most Western nations were increasingly dominated by the growing realization that a global conflict was highly likely, or even inevitable. During the 1920s the austerity measures taken to restabilize the world financial system had cut military expenditures drastically, but with the arming of the Axis powers, war in Asia, and fears of the Soviet Union exporting communist revolution, the priority shifted toward armament, and away from re-establishing a gold standard. The last gasp of the nineteenth century gold standard came when the attempt to balance the United States Budget in 1937 led to the “ Roosevelt Recession.” Even such gold advocates as Roosevelt’s budget director conceded that until it was possible to balance the budget, a gold standard would be impossible. In modern macro-economic thought, the gold standard per se did not "cause" the Great Depression. Instead the standard theory is that the shock of World War I caused the "classical gold standard" to collapse, as nations spent freely to pay for armaments, and continued to do so after the war had ended. The gold standard, which would be created after the war, was not of the same kind as the pre-war standard, and the commitment to the gold standard in the face of economic shocks was not as strong. This cooperative gold standard also faced the problem of normalizing post-war prices with pre-war parities of currency. According to this view the inflexibility of keeping an international gold standard led central bankers to contract money supply in 1929, out of the fear of inflation or a run on currency. With the German hyperinflation, and the 1931 run on the Great British Pound, the fears that a failure to maintain the gold standard would lead to economic chaos seemed to be confirmed, and the "Great Contraction" of currency was continued as a policy. According to modern macroeconomic theory, it was this contraction that turned a credit bust, which was of comparable size to previous over extended economic expansions, into a very severe downturn. While opinions on whether the gold standard could have been maintained without severe contraction vary depending on which model is used, there is wide agreement that the failed attempts to assert and maintain the gold standard, and the failure to rectify structural problems in the banking system and find flexibility in monetary policy were the proximate causes of the Great Depression. This line of argument stems from Friedman and Schwartz' monetary history of the United States, as well as subsequent work by Eichengreen, Bernanke, Bordo and other macro-economists, many of who believe that the understanding of the Great Depression as a monetary phenomenon is the "holy grail" of macro-economics. During the 1939–1942 period, the UK depleted much of its gold stock in purchases of munitions and weaponry on a “cash and carry” basis from the US and other nations. This depletion of the UK’s reserve signaled to Winston Churchill that returning to a pre-war style gold standard was impractical; instead, John Maynard Keynes, who had argued against such a gold standard, became increasingly influential: his proposals, a more wide ranging version of the “stability pact” style gold standard, would find expression in the Bretton Woods Agreement. The essential features of the gold standard in theory rest on the idea that inflation is caused by an increase in the quantity of money, an idea advocated by David Hume, and that uncertainty over the future purchasing power of money depresses business confidence and leads to reduced trade and capital investment. The central thesis of the gold standard is that removing uncertainty, friction between kinds of currency, and possible limitations in future trading partners will dramatically benefit an economy, by expanding the market for its own goods, the solidity of its credit, and the markets from which its consumers may purchase goods. In much of gold standard theory, the benefits of enforcing monetary and fiscal discipline on the government are central to the benefits obtained; advocates of the gold standard often believe that governments are almost entirely destructive of economic activity, and that a gold standard, by reducing their ability to intervene in markets, will increase personal liberty and economic vitality. If the monetary authority holds sufficient gold to convert all circulating money, then this is known as a 100% reserve gold standard, or a full gold standard. In some cases it is referred to as the Gold Specie Standard to more easily separate it from the other forms of gold standard that have existed at various times. 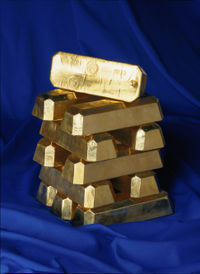 Some believe there is no other form of Gold Standard other than the 100% reserve Gold Specie Standard. This is because in any partial gold standard there is some amount of circulating paper that is not backed by gold, and hence it is possible for monetary issuing authorities to attempt to use seigniorage, and possibly inflation. Others, such as some modern advocates of supply-side economics contest that so long as gold is the accepted unit of account then it is a true gold standard. In a national Gold Standard system, gold coins circulate freely as money, and paper money is directly convertible into gold at a market rate (not enforced by government fiat), reflecting the value of the paper money as a claim check giving the holder the right to a specified amount of gold coin held by the issuer of the note. However, where the value of paper money varies against gold, this indicates that the paper money is fiat money and will often devalue against specie. This has been the case during wars when governments would issue paper currency not backed by specie. Examples include Greenbacks issued by the Union during the American Civil War, and paper marks issued by Austria during the Napoleonic Wars. Such episodes have traditionally led to calls to restore sound money after the war—that is, a hard currency monetary system. In an international gold-standard system, which may exist in the absence of any internal gold standard, gold or a currency that is convertible into gold at a fixed price is used as a means of making international payments. Under such a system, when exchange rates rise above or fall below the fixed mint rate by more than the cost of shipping gold from one country to another, large inflows or outflows occur until the rates return to the official level. International gold standards often limit which entities have the right to redeem currency for gold. Under the Bretton Woods system, these were called "SDRs" for Special Drawing Rights. The commitment to maintain gold convertibility tightly restrains credit creation. Credit creation by banking entities under a gold standard threatens the convertibility of the notes they have issued, and consequently leads to undesirable gold outflows from that bank. The result of a failure of confidence produces a run on the specie basis, which is generally responded to by the bankers suspending specie payments. Hence, notes circulating in any “partial” gold standard will either be redeemed for their face value of gold (which would be higher than its actual value) — this constitutes a “ bank run;” or the market value of such notes will be viewed as less than a gold coin representing the same amount. The gold standard, in theory, limits the power of governments to cause price inflation by excessive issue of paper currency, although there is evidence that before World War I monetary authorities did not expand or contract the supply of money when the country incurred a gold outflow. This belief requires belief that inflation is caused by money supply and not some other issue. It is also supposed to create certainty in international trade by providing a fixed pattern of exchange rates. After the inflationary silver standards of the 1700s, this was regarded as a welcome relief, and an inducement to trade. However by the late nineteenth century, agitation against the gold standard drove political movements in most industrialized nations for some form of silver-based, or even paper-based, currency. Under the classical international gold standard, disturbances in the price level in one country would be wholly or partly offset by an automatic balance-of-payment adjustment mechanism called the “price-specie-flow mechanism” (“specie” refers to gold coins). The steps in this mechanism are first: when the price of a good drops, because of oversupply, capital improvement, drop in input costs or competition, buyers will prefer that good over others. Because the stabilization of currencies to gold, buyers within the gold-based economies will preferentially buy the lowest priced good, and gold will flow into the most efficient economies. This flow of gold into the more productive economy will then increase the money supply, and produce sufficient inflationary pressure to offset the original drop in prices in the more productive economy, and would reduce the circulating specie in the less productive economies, forcing prices down until equilibrium was restored. Central banks, in order to limit gold outflows, would reinforce this by raising interest rates, so as to bring prices back into international equilibrium more quickly. In theory, as long as nations remained on the gold standard, there would be no sustained period of either high inflation, or uncontrolled deflation. Since, at the time, it was believed that markets internally always clear (See Say’s Law), and that deflation would alter the price of capital first, it meant that this would reduce the price of capital, and allow more growth as well as long term price stability. However, in practice this turned out not to be the case: it was wages, not capital, that depreciated in price first. According to modern neo-classical synthesis economics, the Mundell-Fleming Model describes the behaviour of currencies under a gold standard. Since the value of the currencies is fixed by the par value of each currency to gold, the remaining freedom of action is distributed between free movement of capital, and effective monetary and fiscal policy. One reason that most modern macro-economists do not support a return to gold is the fear that this remaining amount of freedom would be insufficient to combat large downturns or deflation. The theoretical possibility of a return to a gold standard has another effect, namely, the question of central bank credibility in a regime not based on hard currencies. Given that major prizes are still awarded for these questions, the gold standard eras, both the nineteenth century and twentieth century versions, remain a baseline against which the current floating currency monetary system is measured. Mundell argued that it would be possible to return to an international gold standard, or even a national one, since in an industrial economy a great deal of capital is immobile. This would allow, in his opinion, a central bank to have sufficient freedom of action to engage in limited counter-cyclical actions, that is, lowering interest rates at the onset of a downturn, raising them to prevent overheating of the economy. This was disputed by Friedman who argued that quantity-of-money effects would produce deflation in such a system, and that successful nations would see less benefit than Mundell expected, since gold entering a nation would produce internal inflation. This argument mirrors the one made by Adam Smith and David Hume in the eighteenth century about increasing the quantity of money not being a worthwhile objective. Some monetarists, objectivists, followers of the Austrian School of Economics, former Chairman of the Federal Reserve Alan Greenspan, and many libertarians, support a strict version of the internal gold standard. In Russia, Pravda has supported a gold standard in various editorials, arguing that a gold ruble would be a counterweight to the power of the American dollar. Various Islamic groups, such as the Hizb ut-Tahrir, support a return to a hard currency economy with gold as a primary backer of currency. Supporters of a gold standard often argue that fiat currency falls in purchasing power over time and that governments cannot be trusted to regulate the money supply. The international gold standard still has advocates who wish to return to a Bretton Woods-style system, in order to reduce the volatility of currencies, but the unworkability of Bretton Woods, due to its government-ordained exchange ratio, as well as the temptation for governments to print more money than would be backed by their reserves, has allowed the followers of Austrian economists Ludwig von Mises, Friedrich Hayek and Murray Rothbard to foster the idea of a total emancipation of the gold price from a State-decreed rate of exchange and an end to government monopoly on the issuance of gold currency. Many nations back their economies by holding gold reserves. These reserves are not intended to redeem notes, but are retained as a hard liquid asset to protect against hyperinflation. Gold advocates claim that this extra step would no longer be necessary since the currency itself would have its own intrinsic store of value. A Gold Standard then is generally promoted by those who regard a stable store of value as the most important element to business confidence. It is generally opposed by the vast majority of governments and economists, because the gold standard has frequently been shown to provide insufficient flexibility in the supply of money and in fiscal policy, because the supply of newly mined gold is finite and must be carefully husbanded and accounted for. A single country may also not be able to isolate its economy from depression or inflation in the rest of the world. In addition, the process of adjustment for a country with a payments deficit can be long and painful whenever an increase in unemployment or decline in the rate of economic expansion occurs. One of the foremost opponents of the gold standard was John Maynard Keynes who scorned basing the money supply on “dead metal.” Keynesians argue that the gold standard creates deflation, which intensifies recessions as people are unwilling to spend money as prices fall, thus creating a downward spiral of economic activity. They also argue that the gold standard also removes the ability of governments to fight recessions by increasing the money supply to boost economic growth. Gold standard proponents point to the era of industrialization and globalization of the nineteenth century as the proof of the viability and supremacy of the gold standard, and point to the UK’s rise to being an imperial power, ruling nearly one quarter of the world's population and forming a trading empire which would eventually become the Commonwealth of Nations as imperial provinces gained independence. Gold standard advocates have a strong following among commodity traders and hedge funds with a bearish orientation. The expectation of a global fiscal meltdown, and the return to a hard gold standard, has been central to many hedge financial theories. More moderate goldbugs point to gold as a hedge against commodity inflation, and a representation of resource extraction. Since gold can be sold in any currency, on a highly liquid world market, in nearly any country in the world, they view gold as a play against monetary policy follies of central banks, and a means of hedging against currency fluctuations. For this reason they believe that eventually there will be a return to a gold standard, since this is the only “stable” unit of value. The fact that monetary gold would soar to $5,000 an ounce (almost 8 times its current value) may well influence the advocacy of a renewed gold standard, as holders of gold would stand to make an enormous profit. If you are on a gold standard or other mechanism in which the central banks do not have discretion, then the system works automatically. The reason there is very little support for the gold standard is the consequences of those types of market adjustments are not considered to be appropriate in the twentieth and twenty first century. I am one of the rare people who have still some nostalgic view about the old gold standard, as you know, but I must tell you, I am in a very small minority among my colleagues on that issue. The current monetary system relies on the US Dollar as an “anchor currency” which major transactions, such as the price of gold itself, are measured in. Currency instabilities, inconvertibility and credit access restriction are a few reasons why the current system has been criticized. A host of alternatives have been suggested, including energy-based currencies, market baskets of currencies or commodities; gold is merely one of these alternatives. The reason these visions are not practically pursued is much the same reason the gold standard fell apart in the first place: a fixed rate of exchange decreed by governments has no organic relationship between the supply and demand of gold and the supply and demand of goods. Thus gold standards have a tendency to fall apart as soon as it becomes advantageous for governments to overlook them. By itself, the gold standard does not prevent nations from switching to a fiat currency when there is a war or other exigency. This happens even though gold gains in value through such circumstances, as people use it to preserve value; the fear is that fiat currency is typically introduced to allow deficit spending, which often leads to either inflation or to rationing. The practical difficulty that gold is not currently distributed according to economic strength is also a factor: Japan, while one of the world's largest economies, has gold reserves far less than would be required to support that economy. Finally the quantity of gold available for reserves, even if all of it were confiscated and used as the unit of account, would put the value of gold upwards of 5,000 dollars an ounce on a purchasing-parity basis. If the current holders of gold imagine that this is the price that they will be paid for giving up their gold, they are quite likely to be disappointed. For these practical reasons — inefficiency, instability, misallocation, and insufficiency of supply — the gold standard is likely to be more honored in literature than practiced in fact. In 1996 e-gold launched a privately issued digital gold currency system, attempting to replicate a gold standard and create an alternative global monetary system. Other digital gold currency systems soon followed, such as e-Bullion and GoldMoney. In 2001 Malaysian Prime Minister Mahathir bin Mohamad proposed a new currency that would be used initially for international trade between Muslim nations. The currency he proposed was called the Islamic gold dinar and it was defined as 4.25 grams of 24- carat (100%) gold. Mahathir Mohamad promoted the concept on the basis of its economic merits as a stable unit of account and also as a political symbol to create greater unity between Islamic nations. The purported purpose of this move would be to reduce dependence on the United States dollar as a reserve currency, and to establish a non-debt-backed currency in accord with Islamic law against the charging of interest. Nonetheless, gold dinar currency has not yet materialized . However, a digital gold currency called e-dinar has been successfully launched. Gold ingots like these, from the Bank of Sweden, still form an important currency reserve and store of private wealth. During the 1990s Russia liquidated much of the former USSR's gold reserves, while several other nations accumulated gold in preparation for the Economic and Monetary Union. The Swiss Franc left a full gold-convertible backing. However, gold reserves are held in significant quantity by many nations as a means of defending their currency, and hedging against the US Dollar, which forms the bulk of liquid currency reserves. Weakness in the US Dollar tends to be offset by strengthening of gold prices. Gold remains a principal financial asset of almost all central banks alongside foreign currencies and government bonds. It is also held by central banks as a way of hedging against loans to their own governments as an "internal reserve". Approximately 25% of all aboveground gold is held in reserves by central banks. In addition to other precious metals, stores of value also include real estate. As with all stores of value, the basic confidence in property rights determines the selection of which one is chosen, as all of these have been confiscated or heavily taxed by governments. In the view of gold investors, none of these has the stability that gold had, thus there are occasionally calls to restore the gold standard. Occasionally politicians emerge who call for a restoration of the gold standard, particularly from libertarians and anti-government leftists. Mainstream conservative economists such as Barro and Greenspan have admitted a preference for some tangibly backed monetary standard, and have stated that a gold standard is among the possible range of choices. Both gold coins and gold bars are widely traded in deeply liquid markets, and therefore still serve as a private store of wealth. Also some privately issued currencies, such as digital gold currency, are backed by gold reserves. In effect, the holder of such currencies is long on gold and short on their own fiat currency, writing checks on their account. The end of the Great Commodities Depression has affected the price of gold as well, gold prices rising out of a 20-year trading bracket. This has led to a renewed use by monetary authorities of gold to back their currencies, but has not constituted adoption of a gold standard for money. In fact, the reverse is the case—the more expensive gold is, the more expensive the acquisition project to create a gold standard becomes.